We’ll work with you to create websites & marketing strategies that perform. WordPress powers over 25% of the world’s websites. It’s a powerful, robust and flexible content management system that’s easy to use and amazing to customise. We’re a pretty impatient lot! As customers, we often want to be able to order straight away. We offer comprehensive e-commerce websites that allow you to sell your products and services. In order to maximise your success we provide ongoing marketing and training consultancy to ensure your e-commerce website helps you achieve your success. A website on its own won’t deliver results. 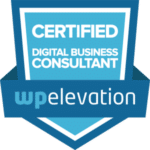 We provide expert help and consultancy to boost your website’s visibility using social media & content marketing as well as search engine optimisation. Your website is crucial to your business and it needs to be available 24/7. You want peace of mind that it will be up and available for your audience without interruption. We have over 15 years’ experience hosting websites and have a dedicated cloud server service with quick and friendly support. We’ll fully manage your website hosting and back-ups (daily and weekly). If disaster strikes, we can get you up and running from one of the backups. We provide on-going support, training and consultancy so that you know you have that support when you need it most.